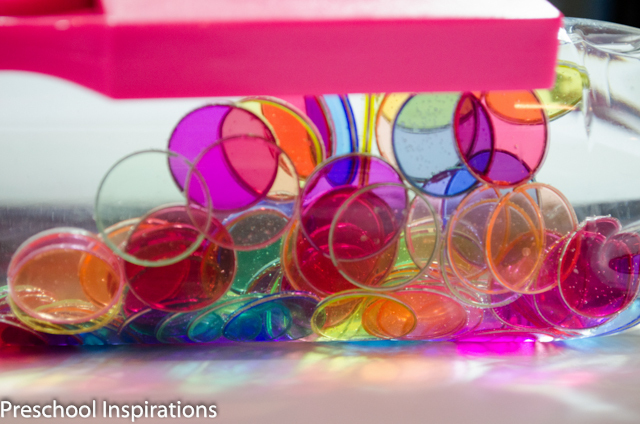 I love it when I find a new sensory bottle to tantalize my preschoolers. 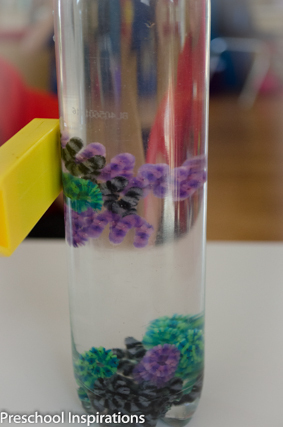 My two newest discovery bottles are magnetic, and my class is over the moon for them! They are a cinch to make, and they are absolutely entertaining for older kids and safe for toddlers as well. 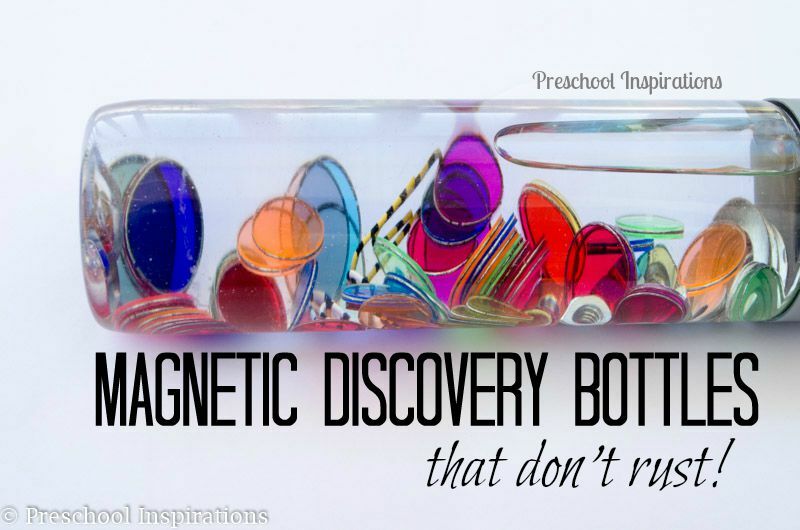 I’ve made magnetic sensory bottles in the past, but the magnetic attraction wasn’t as strong as I would like. So I came up with some extra powerful magnetic discovery bottles. 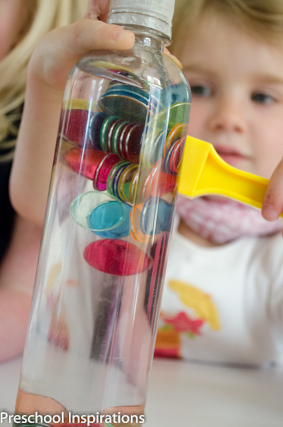 I just love how the chips flow and gently glide through the bottle with the help of a magnetic wand! Want to see it in action? Here’s an awesome video about it! 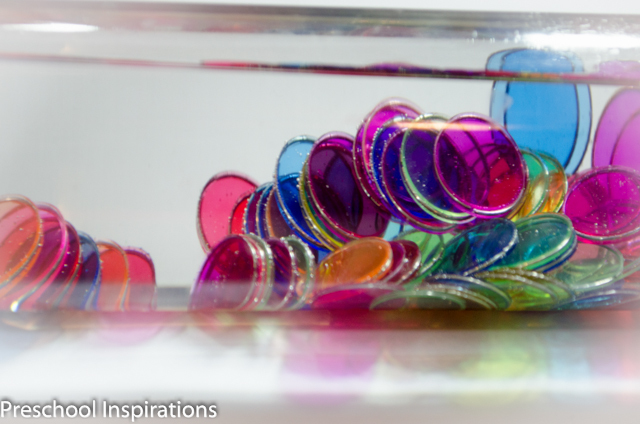 I used my entire pack of magnetic chips from the Super Magnet Kit Lab, so there are about 100 chips in my bottle. I’ve probably misplaced a few along the way, so maybe not quite 100, but close! 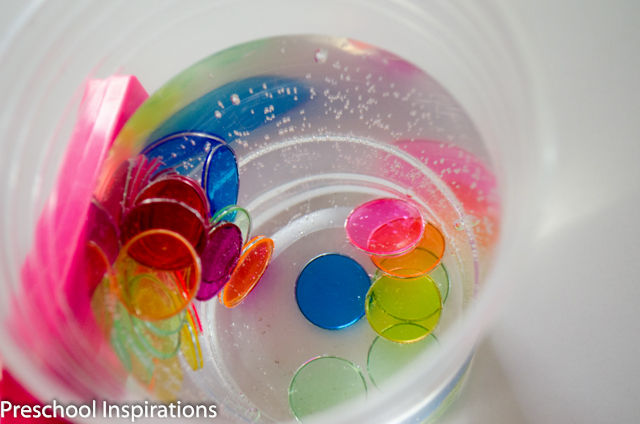 Add as much oil as desired, then super glue or hot glue the lid on for little ones who could choke on the magnet chips. 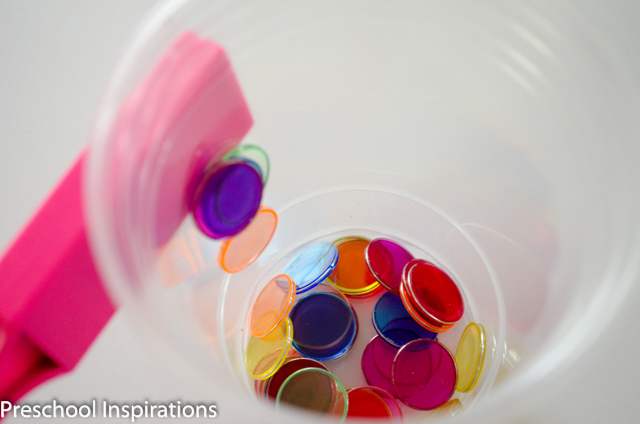 Since magnetic chips are lightweight, they are the perfect magnet to go inside the sensory bottle! 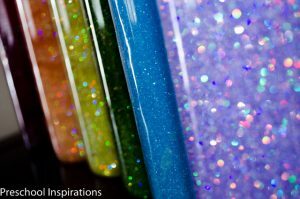 I’m sure these would look awesome with some glitter mixed in or on a light table too! Update: We have now found a way to make a long term, rust resistant magnetic discover bottle. You can read it about it here. Now for the second discovery bottle. I like to think of it as a bottle of swirly, whirly, striped goodness! Just make the bottle with the directions from above and swap out the magnetic chips. 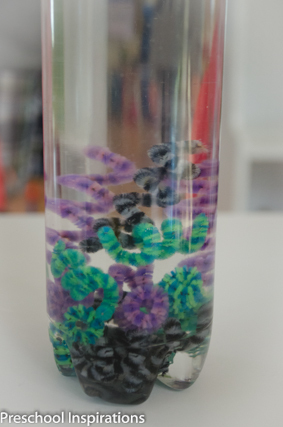 For this discovery bottle, I added some chenille stems also known as pipe cleaners. I curled them around a pencil and cut them in half or in thirds. Don’t you love the stripes? This is my ultimate favorite pattern on pipe cleaners! 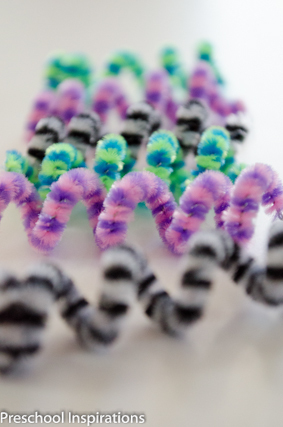 You can get striped pipe cleaners at Amazon or any craft store or school supply store. This one was so much fun to play with too! When we experimented without water, they hardly even budged at this size. I love how the liquid makes this so magic and so “floatable.” Yes, I definitely just made that word up. Thank you, Asia!!! They seriously are so mesmerizing and addicting :). I look forward to seeing them on your awesome facebook page soon! This is great! I need to get some of those magnet chips! Thanks for linking up at the Thoughtful Spot Weekly Blog Hop! We hope you join us again next week! Where can I get the handheld magnets? I bought some at Ikea a few years ago but can’t find them anywhere! Mag-Wands – Set of 6 . Otherwise I see them occasionally at school supply stores. And of course Amazon has nearly everything. I hope you find some great ones! 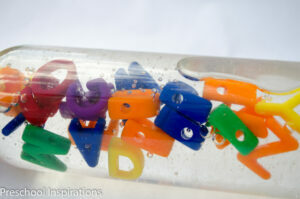 I saw that you have a link to put letters in a sensory discocery bottle as well. I would think those would work as a magnetic discovery bottle as well if yoy got the refrigerator letters. I don’t have any experiance with the particular magnetic wand you are using but I would assume and currently my boys (2 & 3) love anything thats magnetic letters and goes in water so itd be perfect. These are wonderful. Thank you so much for everything you share Im using it at home and Ive started a binder to brainstorm off of your ideas once I complete school. These are great! Do you think you could use oil instead to avoid the rust issues? Thank you, Samantha! There definitely is a solution to the rust!! I plan on posting it next week, and I’ll link to it in this post as well :). Do you mix the water & oil together, & how much do you use? Tanya, it needs to be 100% oil. Take all of the water out :). Enjoy!